Buddy Blog! : Soulja Boy video released!! The music video we did with Soulja Boy Tell'em dropped today! It was a whirlwind production, being conceived, shot, animated, and edited together in just a month! 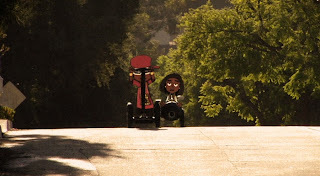 It's a hybrid style that combines live-action footage with cut-out characters animated on the downshooter. We're also producing an animated pilot for the Soulja Boy web series! More on that soon! UPDATE 01/13/09: Video hit 1,000,000 views on YouTube! !